FIFA 19 Headliners items will hit the FUT 19 store on February 1st. This new event is centred on players who are on an exceptional run of form during the season so far. Let’s find out more about this event and its offers. 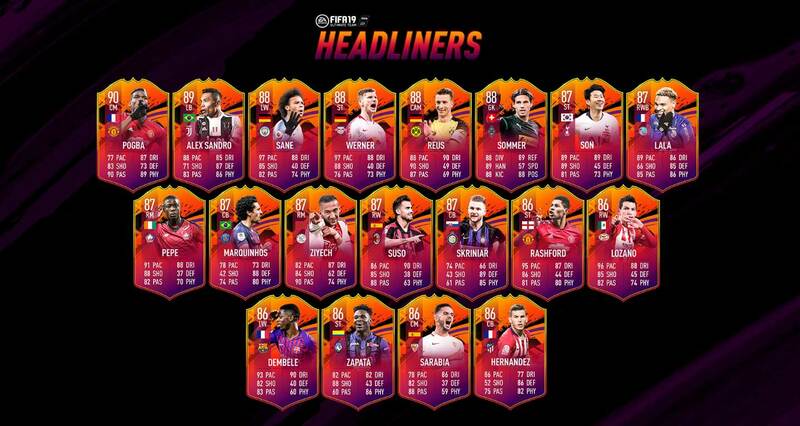 Introducing FUT19 Headliners, a brand new event centred on players who are on an exceptional run of form during the season so far. Each FUT19 Headliners player is released on a brand new item type which dynamically updates in a unique way. At the launch of the event, each FIFA 19 19 Headliners player item type is released at one in-form upgrade higher than their latest qualifying performance-based in-form (TOTW, MOTM, Hero, Record Breaker or Team of the Group Stage item). Each time the FUT19 Headliners player earns a subsequent qualifying performance based in-form, their FUT19 Headliners player item type will dynamically increase to always be one in-form upgrade higher. A such, The FUT 19 Headliner upgrade will always stay one in-form ahead of the most recent qualifying performance based in-form throughout the remainder of the season. The first FIFA 19 Headliners items will be released in packs, for a limited time, on February 1st. 3 additional FIFA 19 Headliners will be released through SBCs and objectives during the course of the event. 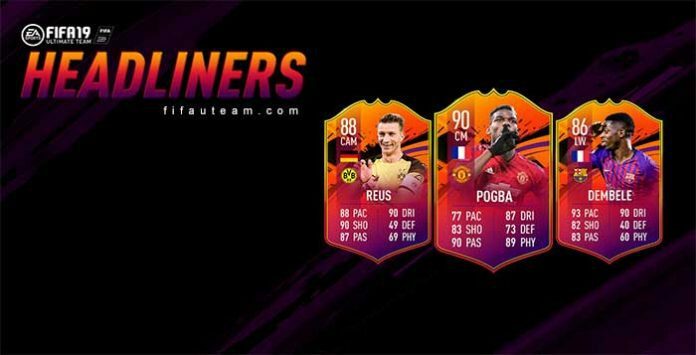 A: The FUT 19 Headliner upgrade will always stay one in-form ahead of the most recent qualifying performance-based in-form. For example, Marco Reus has a latest TOTW In-Form rated 87, therefore his FUT 19 Headliner item is rated 88. If he gets another TOTW in-form, that second TOTW item will be rated 88 and his FUT 19 Headliner item will accordingly move to 89. 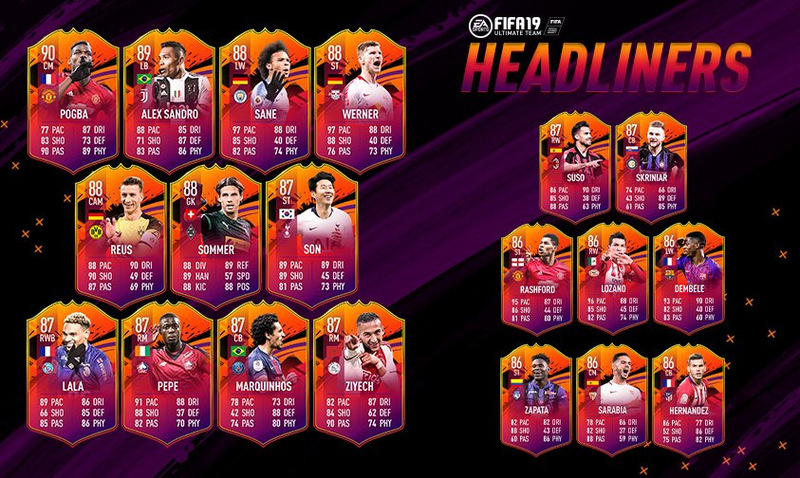 A: A FUT 19 Headliner item will be upgraded when they earn a qualifying performance-based in-form: TOTW (until the end of the 2018-19 season), MOTM, Hero, Record Breaker and Team Of The Tournament selection. During the FIFA 19 Headliners event, there are several offers available, like promo packs available on the FUT store, SBCs and themed objectives. We will publish them all on this page. EA is offering packs to the most loyalty players. If you logged in to FUT 19 for 9 days or more, you have a free pack waiting for you! Will Headliners upgrade if their player get a TOTS card? Didn’t find anything on EAs website. Will headliners gonna update based on fut birthday card? Pq as versões HL não alteraram do Kenny Lala e do Pepe, da ligue 1, com o winter upgrade? Julgo que por os IFs terem continuado abaixo da sua HL. Rodrigo se o Headliner ganhar um TOTS ele vai ganhar + com relação o TOTS? Não. Isso apenas funciona para itens TOTW, MOTM, Hero, Record Breaker e TOTGS. Are the headliner upgrades permanent? I.e: if the player gets an IF and therefore the headliner goes +1 is the +1 permanent? I have searched so many hours but I cannot find headliners players in transfer market (pc). There is no one to buy. Why? You can’t use the filter ‘special’ because they are not there. Why can’t i buy headliners on my fifa?